Life saving medications are being withheld from legitimate pain patients in response to our nations “opiod crisis”. I’m sure this crisis does exist, but probably not in the populations that are most effected. I am lucky. My doctor still prescribes the medications I need to address pain. Some other patients aren’t so lucky. They can have their meds cut off, reduced and discontinued for no reason at all as Chronic Pain Physicians are admittedly being pressured by the government agencies. These pills are my lifeline. They don’t make me high. They don’t even make me buzzed. They manage my pain. They help me live! To get these meds, I go once a month, answer a few questions and pee in a cup. As a result, my insurance is billed about $500 to read a simple drug test. It feels similar to what I would imagine being on parole or having some other issue that requires drug monitoring. I can’t believe in our sophisticated healthcare system and access to vast amounts of information that we can’t find a way to treat legitimate, documented chronic pain patients more like patients and less like prisoners. Perhaps the CDC and other government agencies, and yes they readily admit their plan is flawed, should actually take the time to talk with some actual patients before setting policy that so far has resulted in financial hardship, horrible treatment by the medical community and in a few cases which seem to be on the rise, Suicide. 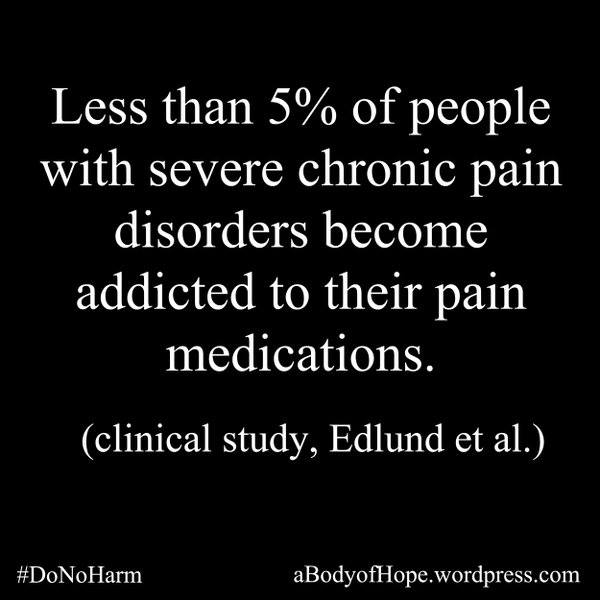 Less Than 5% of people with severe Chronic Pain Disorders become addicted to their pain medications. The science of weight loss is fascinating. Read this to see why your body is always fighting to gain it back. May marks the third annual National Disability Awareness Month. 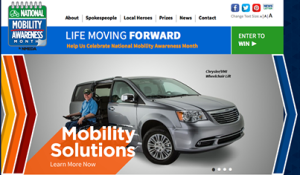 To celebrate, the National Mobility Equipment Dealers Association (NMEDA) has kicked off it’s Disability Awareness Month Local Heroes Campaign. The campaign celebrates individuals with a disability who work to raise awareness of mobility solutions in their community. NMEDA will give away at least three wheelchair accessible vans to selected “local heroes” who have overcome the challenges of living with a disability, and who embody the spirit of Life Moving Forward. According to NMEDA, local heroes can be defined a people who volunteer, educate, advocate, achieve and persevere. If that sounds like you, or someone you love, go to www.mobilityawarenessmonth.com and enter. Voting begins March 11 and ends May 9. Good Luck!